This red-tailed hawk is near release-ready. Her feet are pulled up, and she is able to fly through the hanging poles with skilled precision. 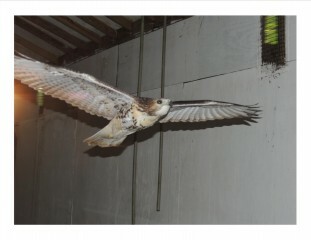 Her endurance is good, and she is already flying several miles each day inside the flight cage. Our flight cages are of a special design that encourages flight, while preventing damage to feathers and injury to the bird. They are of solid wall construction with windows at each end, which encourage the birds to fly, end to end. We have found that they often fly many hours each day as they rebuild flight muscles. We can hear them from outside the flight enclosures as they perch at each end. Our flight cages vary in size, but the smallest of our five flight cages is thirty feet long; the largest is 100 feet. We are able to condition each birds to be release-ready, and we can also determine their weaknesses by observing their flight. We compare their flight behavior to that of the many wild birds of their species that we have observed during our research and monitoring projects.